Being prepared for a house fire is an important safety step for all families. Having several working smoke alarms in your home, fire escape ladders in upstairs rooms, an evacuation plan, and meeting place are just a few of the steps all families should take to insure safety in case of a fire. But does your fire safety plan include your pets? If you leave pets home alone Mike Greenham of Durham Highway Fire Department in Raleigh, NC recommends affixing a Pet Finder sticker to all access areas of your home. These stickers have space available for pet owners to write the number of dogs, cats, birds, or other pets on the sticker. These stickers alert emergency personnel that there are pets in your home so that they can help rescue them. Greenham also recommends affixing the sticker at your place of business if your pet goes to work with you, and on your recreational vehicle. Greenham recommends that leashes and collars be kept in an easily accessible location so that if your home or building needs to be quickly evacuated, precious time is not wasted looking for these items. He also suggests enrolling in a Pet First Aid class offered by the American Red Cross and becoming familiar with pet CPR. Knowing basic pet first aid, as well as pet CPR can help pet owners be prepared for fires or other emergency situations. In addition to creating a fire safety plan that includes your pet, pet owners should also take steps to make sure their pets don’t start fires. According to the National Fire Protection Association nearly 1,000 house fires each year are accidentally started by the homeowners' pets. Greenham states that many pets are naturally curious about open flame. To reduce the chances that pets knock over candles or get too close to a fire in a fireplace, pets should not be left unattended. “It’s important to make sure candles are put out so that a dog or cat can’t knock over the candle and start a fire. In addition, make sure that fireplaces have protective screens so that pets can’t get burned,” said Greenham. If you have pets that jump, another safety tip to consider is removing knobs from stoves if you will not be home. Pets can jump on stove knobs, accidently turning on the stove or burners, leading to an unintentional fire. Another potential hazard, pets that chew on electric cords. Chewing through cords can spark a fire, but this behavior can also endanger your pet due to possible electrocution. If your puppy or kitten has a tendency to play with or chew on electrical cords, redirect their attention to appropriate toys, unplug cords to items not in use, or consider purchasing a product at your local pet supply store that can be sprayed on the cord, making it “taste” bad to your pet. When responding to a fire that involves pets, Greenham says, “Firefighters make it a point to search for pets if we know about them. Quickly communicating that you have an unaccounted for pet to the first arriving Fire Department units will speed the search.” Like Firefighters at many stations across the United States, the Firefighters at Durham Highway Fire Department are also trained in basic pet first aid and pet CPR. 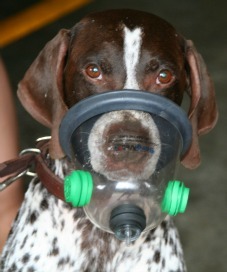 Their fire trucks are equipped with oxygen masks for pets. These specially designed, cone-shaped masks are longer, allowing them to fit properly over a dog’s mouth and nose. “Pets have a tendency to ‘spook’ easily in a fire and will often bolt for the outside or hide in uncommon places, much like children. Communicating where your pets may be is essential to a quick and successful rescue,” said Greenham.